Do Universities Make Good Academy Sponsors? 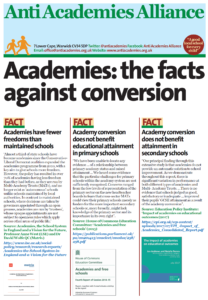 A feature of academy schools and academy trusts has been the involvement of universities as sponsors. The prospect of a university sponsor may seem more palatable than a private multiple academy trust (MAT) but do universities necessarily make good sponsors? Posted in News, Top story	| Tagged Sponsors, Universities	| Comments Off on Do Universities Make Good Academy Sponsors? 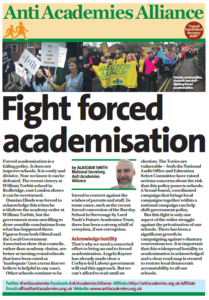 Trevor Averre-Beeson was the Head teacher at Islington Green and pushed through the move to academy status against fierce opposition from trade unions and the community in 2008. He has now written a book about his experience, called ‘We Don’t Need No Education – 101 ways to transform a school’ . This week the Don Valley Academy has gone into special measures. It is sponsored by the School Partnership Trust Academies. 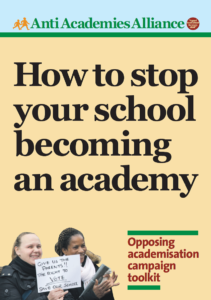 This organisation has been running academies since 2009, so before any new school is allowed to be run by them, surely someone somewhere looks at their record? They run 41 schools, the latest being 5 schools running from September 2014. A story has appeared in the Observer 19/10/14, that looks into the claims that three schools had prior warning of an Ofsted visit. It reveals new emails that indicate that they had prior knowledge of an inspection. They also reveal expenses including a Vera Wang teaset costing £420.